Before 1843 letters destined for Gravesend, which had no post office, went instead to Flatbush, where any passing resident could collect his mail and any for his neighbors to deliver at leisure. Shopkeeper Martin Schoonmaker became the town’s first postmaster that year, and he served until 12 July 1854, when he was succeeded by 22-year-old fisherman Gilbert Hicks. Hicks, a son of Thomas and Cornelia (Van Sicklen) Hicks, was born at Norton’s Point (now Sea Gate), Coney Island, on 6 March 1832, but by the time of his appointment as postmaster, he was living with his family in the house now known as 27 Gravesend Neck Road–commonly called “Lady Moody’s House”–which his mother’s Van Sicklen ancestors had owned for generations. Eventually he moved to Flatbush, where he died in 1903. 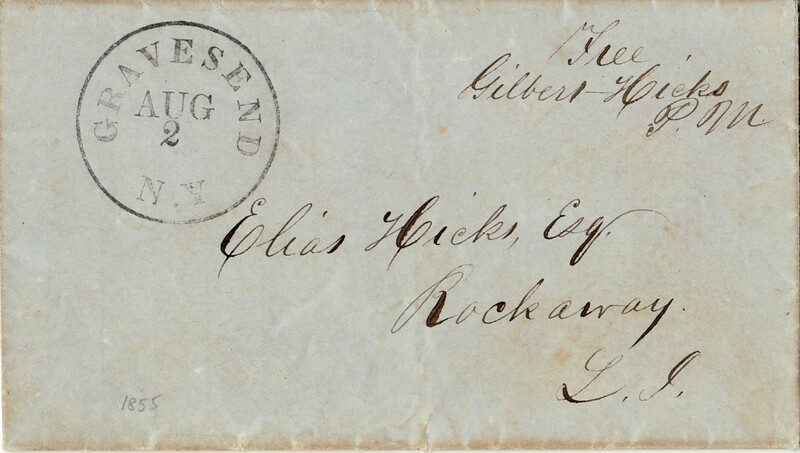 In the letter below, dated 1 August 1855 and postmarked the following day, he wrote to his uncle Elias, who lived in Rockaway, then a part of the town of Hempstead, which belonged to Queens County until 1898. Note the use of his franking privilege as postmaster to send the letter free of charge. “Dr. Baisley” is probably Robert B. Baisley, a Rockaway physician born around 1819; he does not appear to have been appointed to the position discussed. And the “melancholy accident at Coney Island” refers to the drowning deaths of the Rev. John H. Elliot of Williamsburg(h) and his daughter, who were dragged down by the undertow while bathing near the Oceanic House on 25 July. Mr. Samuel Hubbard of this village, who is one of the Superintendents of the Poor of Kings County wishes me to write to you for some information, which he thinks you can give him. He says that the new Lunatic Asylum at Flatbush is completed, and that at the next meeting of the Board of Superintendents they will most likely appoint a physician to take charge of it. There are several applicants for the appointment, and among them a Doctor Baisley of Rockaway. The Superintendents desire to appoint a capable and worthy physician: one well qualified to discharge the duties which would necessarily devolve upon him in the Institution. Mr. Hubbard thinks it very probable that you are acquainted with Dr Baisley, and can furnish him with some information respecting him. Mr H. would be greatly obliged to you if you would write immediately (or as soon as you can possibly) and give him your opinion of Dr Baisley, and also state whether you think he would be a proper person for so responsible an appointment. It is worth a thousand dollars a year. Direct the letter to Mr Hubbard who will consider it strictly confidential. We are all as well as usual. Fish are unusually scarce just now but bring a good price. Mother went to Aunt Fanny’s week before last. She found all the folks there well. I supposed you have read the newspaper accounts of the melancholy accident at Coney Island. I am unable to add anything to those accounts. Had the proprietors of the bathing houses furnished their establishment[s] with boats, ropes &c as they should have done no lives would have been lost. Now, after the accident has occurred, they have got them. There are very few boarders at the boarding houses on the Island this season, and since the accident on the shore the bathing house has been but poorly patronised. People are afraid to venture into the water. The farmers, here, are carrying their potaters to market as fast as they can get them out of the ground. They are worth from 4/6 to 5/6 per bushel. The wet weather if it continue[s] much longer, it is feared will set them rotting. Uncle Elias we would be very happy to have you make us a visit. It is quite a long while since you were here last. If I can spare the time, I will try to make you a short visit next Fall. I would like dearly to visit Far Rockaway. I have not received a letter from Uncle Isaac in a long while but I occasionally receive papers. Give my best wishes to Uncle William, and to Potter. Mr. Gravesend: I live in Gravesend, and my mail STILL goes to Flatbush. Perhaps you should take this up with Gilbert Hicks. His home, since March 11, 1903, has been Green-Wood Cemetery, section 145, lot 23811. I’m sure he’d be thrilled to hear from you.